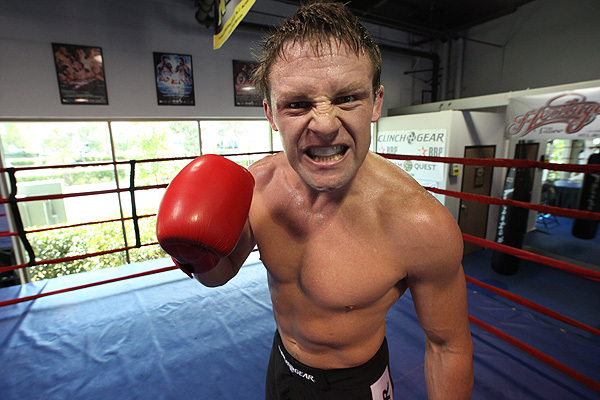 Joe Warren has heard Marcos Galvao’s complaints. He’s just not buying them. Warren, the current Bellator MMA World Bantamweight Champion, was the first fighter to welcome Galvao to the Bellator MMA cage. The two met on a hot, sweaty night in April 2011 in Yuma, Ariz.
Galvao got out to an early lead, outgrappling and outstriking Warren in the opening stages of the contest. But Warren, the self-proclaimed “Baddest Man on the Planet,” wouldn’t go away without a fight, and he battled back to control the closing minutes of the matchup. In the end, all three judges felt he had done enough to take home a victory, and he was awarded a unanimous decision win. Warren admits it wasn’t his best night but believes he showed some of his character by grinding out win, no matter how controversial. “It wasn’t my best night,” Warren admits. “But I still found a way to get the win. That’s what matters most. Four years later, Warren and Galvao cross paths again. The two headlines Friday’s “Bellator MMA: Warren vs. Galvao,” which takes place at Winstar World Casino in Thackerville, Okla., and airs on Spike TV. Galvao has made it clear that he looks at the contest as an opportunity for at least some measure of revenge. Warren doesn’t seem to feel there’s any need to view the fight as anything other than another day at the office. The first time Warren and Galvao fought, the contest was slated for three rounds instead of five. This time, the two will have a full 25 minutes to determine who is the better man, and the winner will leave the cage not only with bragging rights, but also with the Bellator MMA Bantamweight World Title. Warren seems to believe that all of those factors are simply working in his favor. After their first meeting, Warren would go on to lose two consecutive fights, leaving some wondering if he could fulfill the lofty standards he has established for himself in a fast-rising career. However, he is unbeaten since, rattling off five consecutive wins, including back-to-back victories in title fights. On Friday, Warren has a chance to further cement his growing legacy by soundly defeating a man who currently has reason to believe he’s capable of beating “The Baddest Man on the Planet” by virtue of their razor-thin first meeting. At that point, Warren can go on to the greatness that he feels lies on the horizon. “I know there are all sorts of guys who want a piece of me,” Warren said. “I’ll fight them all. They’re not going to find anyone tougher than the guys I’ve already beat, so bring them all.